The Circle Chronicles - Now Available at Salon True ~ Come See What All the Hype Is About! Welcome to Salon True, a sophisticated, full-service salon located along the Main Line in Ardmore, PA. Salon True exudes elegance and warmth with personalized hair services from our talented, creative stylists. Specializing in precision cuts and an extensive color bar, we offer total beauty care for both men and women. With a drive for innovation and a passion for color, our proprietor has acquired years of styling experience. Salon True’s chic atmosphere is complemented by our first-class services, which cater to our clients’ daily needs. We guarantee our products and services 100% and are committed to our clients’ satisfaction. We invite you to experience our salon, where you can live, love and be true. Contact us today to request an appointment. 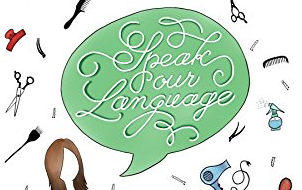 Hot off the press, Speak Our Language, is a fun, short guide that gives you insight into what hairstylist are thinking behind the scenes and will help you communicate better when speaking with your hairstylist (or help you find one that fits your personality and needs!). This great girlfriend’s guide is available on Amazon for $3.99 and can be read on any device. Click here to purchase and download Speak Our Language for yourself or a friend.